Syrian sovereign independence impedes Washington’s objective for regional dominance along with Israel – why Obama launched naked aggression on the country in March 2011, wanting Iran isolated, ahead of a similar campaign to topple its government. Instead of stepping back from the brink, Trump heads for escalating war on Syria based on a Big Lie, the pretext for all aggressive wars. Led by US-warships and warplanes, the largest strike force since naked aggression on Iraq is being readied to attack Syria. Trump’s war cabinet is considering the severity of what’s coming, John Bolton reportedly urging a major attack, Mattis calling for limited strikes. America’s naval task force includes four guided missile destroyers in the Mediterranean Sea close to Syria’s coast, armed with hundreds of Tomahawk cruise missiles. US nuclear submarines are likely moving into position for an attack. The Harry S Truman carrier attack force (armed with hundreds of cruise missiles and warplanes) is en route toward the eastern Mediterranean, days before it arrives. A UK task force includes one or more guided missile destroyers and nuclear submarines. 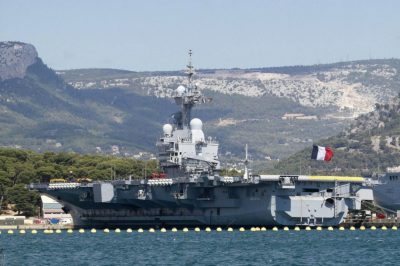 France readied warplanes to participate in an attack if ordered. Russia has naval forces in the Black Sea and eastern Mediterranean, along with Syria-based warplanes. Reportedly two or more Russian strategic long-range heavy bombers were deployed to the region, possibly to Iran. Anti-submarine aircraft were sent to Khmeimim airbase in Syria. UK Prime Minister Theresa May’s war cabinet unanimously backed her call to ally with US aggression against Syria, MPs likely left out of decision-making. On Thursday, Trump and May spoke by phone, both agreeing to cooperate on an “international response” to the alleged Douma CW incident – what didn’t happen. It doesn’t matter when Washington is hell bent for war. Any pretext will do – from nonexistent WMDs in Iraq to fake humanitarian intervention in Libya to the false flag Douma CW incident, despite no toxins found, no one ill, nobody hospitalized with symptoms of toxic poisoning, no one dead, no evidence proving anything happened. According to CNBC, eight principle targets in Syria may be struck if hostilities begin, including Syrian airfields, a research center and mischaracterized chemical weapons facility. At this point, it’s speculation. Any number of targets could be struck if Trump orders escalated aggression on Syria, including possible shock and awe bombing. Things unfolding represent a defining moment for Vladimir Putin – the most significant one since US war on Syria began. Will he order cruise missiles aimed at Syrian targets downed, as Russia’s ambassador to Lebanon claimed? Will he contest US-led aggression on Syria based on a Big Lie? Is attacking Syrian targets likely coming a red line he’ll resist – forcefully enough to show he’ll no longer tolerate US-led aggression? Or will he resort to rhetoric alone like earlier, achieving nothing, encouraging greater US aggression. Whatever Washington and its rogue allies intend this time could be followed by greater war ahead if not forcefully challenged. Sooner or later Putin has to decide if he’ll resist increasingly aggressive US behavior. If not in the Middle East, it could be in Russia’s heartland ahead, a far graver situation if develops. Bullies like America don’t back off unless forcefully challenged. Now is the time for Putin to contest what he’ll no longer tolerate. Pretending Russia and America are partners is defeatism. Less talk and more action is essential, perhaps the only way to avoid potential disaster ahead. The lesson of events preceding WW II showed the failure of appeasement. If Hitler was confronted before things got out of hand, WW II might have been avoided, millions of lives saved. The best way, perhaps the only way, to prevent another global war with nukes this time is by confronting Washington forcefully enough to show its bullying no longer will be tolerated. Now is the moment for Putin to act!